Dallas is a city born as a low-rise post of agricultural trade and developed into the gleaming mecca of a 20th-century petrochemical boom. It is a city synonymous, for many Americans, with big hats, oil money and the gunman that took the life of John F. Kennedy — and with that, ended an era. Its downtown of shiny towers, and the sprawl radiating from there, expresses all of that, as does a population boom that has nearly doubled the city’s size since 1963. Although Dallas deserves some of the infamy that Texas in general has earned for its sprawl, recent developments demonstrate support for revisiting some of the city’s urban design failures. 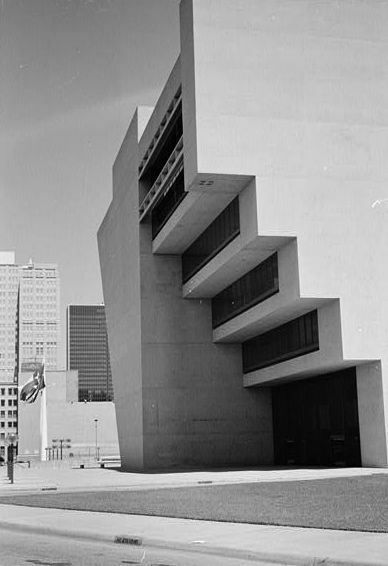 These show how far Dallas has come since the day at the book depository, a time when the city saw relatively little major construction save the modernist office box of the Republic National Bank Building, designed by Harrell & Hamilton and opened in 1964. In the last year, Dallas has completed an ambitious highway deck park project, and some of its leaders envision removing a freeway altogether. A streetcar line is under construction. Still, challenges remain in transcending an architecturally fragmented landscape that lacks powerful landmarks of civic identity. One year after the opening of the Klyde Warren Park atop the Woodall Rodgers Freeway, a group of urbanists are raising the banner of “A New Dallas” — a Dallas in which monolithic downtown-busting Interstate 345, built in 1973, disappears forever. I-345 connects the Woodall Rogers with the RL Thornton Freeway (I-30), while severing downtown Dallas from the arts and entertainment hub of Deep Ellum and Near East Dallas. A New Dallas proposes replacing the interstate with some 30 new city blocks, four parks and an estimated $4 billion worth of redevelopment. The group’s website forecasts 25,000 new downtown residents as a result of the project, and its credentials place it in league with highway removal groups like 8664 in Louisville or City to River in St. Louis. The two people behind it, Walkable Dallas-Ft. Worth blogger Patrick Kennedy and Green Shoots Development principal Brandon Hancock, are well-known voices for change in Dallas. Kennedy advocates for functional sidewalks and urban design standards, while Hancock builds urban infill on vacant lots. A few years ago, A New Dallas may have seemed like a radical idea. But in the wake of Klyde Warren Park, it looks like a progression — one that Mayor J. Erik Johnson started unwittingly in the 1960s, when he demanded that the highway be placed below grade to minimize its impact on downtown streetscapes important to the city’s business elite. Burying the Woodall Rogers was logical and achievable. Klyde Warren Park was not an upstart urbanist proposal, but a consensus-building $110 million idea overseen by an established local institution, the Woodall Rogers Park Foundation. Advocates for covering over the noisy, windy interstate found linchpin champions in Jody Grant, Chairman Emeritus of Texas Capital Bank, and his wife Sheila Grant. One Grant marshaled the business community behind the park, while the other reached out to philanthropic circles. Supporters saw the deck park as more than a landscape attraction. Jody Grant saw the need for a catalyst investment in downtown Dallas. 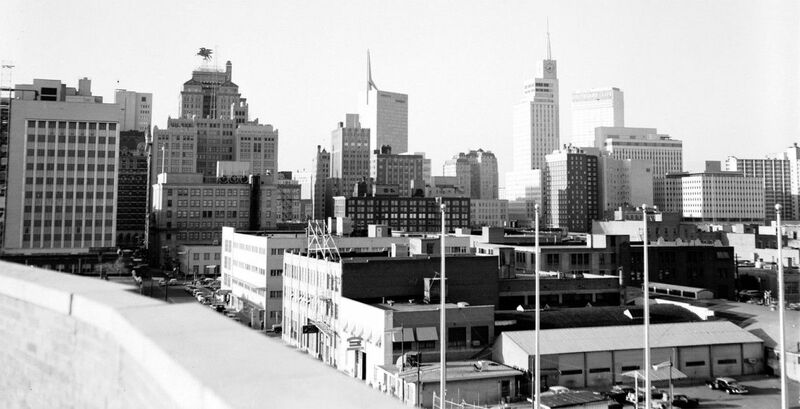 “Downtown Dallas was just destroyed in the 1980s as a result of the recession,” he told D Magazine in a 2012 interview. “Dallas has had a challenge ever since.” Klyde Warren Park was part of the answer to that challenge. The proposal from A New Dallas may be another. 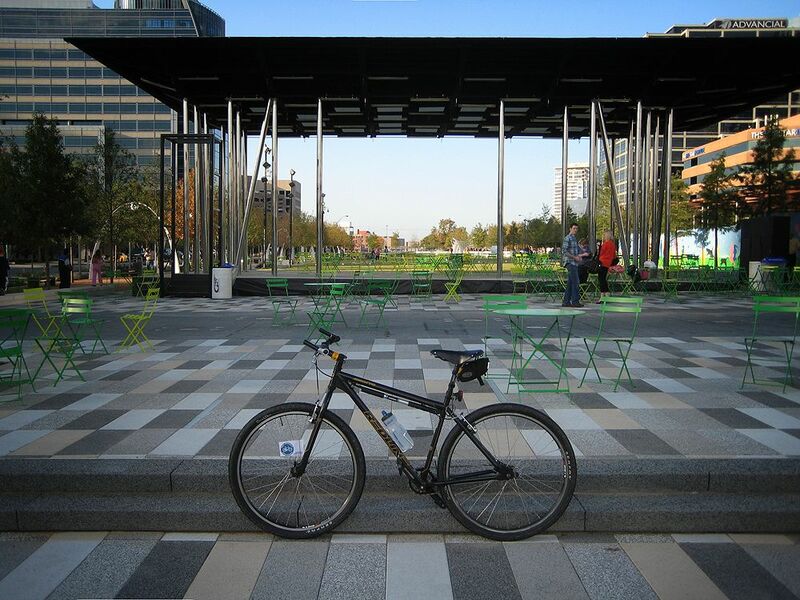 Klyde Warren Park introduced an amazingly popular, active landscape into Dallas’ stoic grid. More than 400,000 40,000 people visited the park’s opening day, enjoying the sweeping primary paths, sun-swept lawns and ample play areas. The Office of James Burnett, best known for its Texas work including Houston’s Westwood Technology Center and the Exxon Greens Road House, served as principal designer of the 5.2-acre deck park, which is based on playful convergences and contrasts. Biederman Redevelopment Ventures, headed by New York City park activator Daniel A. Biederman, was another key player. The park’s repeated tapered arches provide whimsical wicket-like elements, playfully teasing triumphal arch and landscape gate traditions, while contoured elements overwhelm the inherent flatness of what is, after all, a steel highway deck. The arches also seem to reference the curved span of the Santiago Calatrava-designed Margaret Hunt Hill Bridge over the Trinity River, which opened earlier in 2012. The frame of the park is urban, so the space is visually bounded and urban. Burnett’s firm also collaborated with James Pfifer and Associates on the award-winning glass box Brochstein Pavilion at Rice University in Houston, and the clever Park at Lakeshore East in Chicago, built on fill in the Streeterville district. Klyde Warren Park opened with the addition of two embedded restaurants, providing an element that has become standard for so-called signature downtown parks. Visitor attendance has not waned, and the green space is a likely catalyst for real estate development. Downtown Dallas has demonstrated to other cities the power of committed, established civic leadership in solving design problems created by highway infrastructure. After Kennedy’s assassination, Johnson championed a “Goals for Dallas” campaign that focused on new public buildings. Dallas City Hall, the Dallas Convention Center and the Dallas Central Library came through the $175 million bond issue. I.M. Pei’s City Hall (1977) remains an icon, and amplifies the famously controversial Brutalism of Boston City Hall (1969) through an inverted pyramid profile and pronounced recesses. City Hall and the Central Library, both built in concrete and designed in a rugged Brutalism, reinvented the look of civic Dallas in wake of a national tragedy. Today they remain in use, a testament to Johnson’s vision. Still, Dallas’ skyline has a decidedly postmodern cast, and while the towers reach impressive heights there is not much diversity in the overall grouping. No major skyscraper has risen in Dallas since 1989, while few date to before 1948. Bank of America Plaza (1985), designed by local firm Jarvis, Putty & Jarvis, is the city’s tallest building. The notched reflective glass design is best remembered for the green lights that emblazon its silhouette on the city skyline. The genial but underwhelming form is perhaps emblematic of Dallas’ architectural self — underdefined, slightly uncertain. That self is incongruent with the big-talking swagger of the corporate and political forces that have shaped the city. More striking additions to Dallas’ skyline in the halcyon postmodern age were the steroid-induced barrel vault pile of Johnson & Burgee’s Comerica Plaza (1987) and Pei’s crystalline formation of Fountain Place (1986). The architectural symbol of Dallas, however, has become the Reunion Tower, a light-bejeweled spherical curiosity that punctuates skyline scenes in The Lathe of Heaven, Robocop and The Thin Blue Line, among other films featuring Dallas. Designed by Los Angeles’ prolific Welton Beckett Associates, Reunion Tower dates to an urban renewal project centered on the historic Union Station. Wolfgang Puck opened a restaurant inside the geodesic dome in 2009, garnering renewed interest. Critics, though, have never given Reunion Tower’s architectural merit high marks. Commemoration of the Kennedy assassination itself has been fraught with evident indecision of appropriate emphasis on the event. Philip Johnson’s John F. Kennedy Memorial (1970) offers an inward-focused bunker of white concrete pillars around a dull black plinth — architecture that critics panned for its blankness and lack of power. Meanwhile, the assassination site itself is mired in the rush of traffic on Elm Street and the Triple Underpass, lacking visual coherence or a pleasant pedestrian experience. Dealey Plaza became an official landmark, and its Beaux Arts formalism preserved for both its late City Beautiful aesthetics and its significance as backdrop to horror. Garish Xs marks bullet strikes, while the Texas School Book Depository stands as evidence that historic preservation can embrace the most uncomfortable built traces of American history. Yet this week the city unveils a new monument at Dealey Plaza, consisting of an aluminum alloy plaque bearing words from the speech that Kennedy never lived to deliver on November 22, 1963. Dallas Morning News architecture critic Mark Lamster called the plaque the “latest manifestation of this ambivalence” in Dallas’ own commemoration of the assassination. 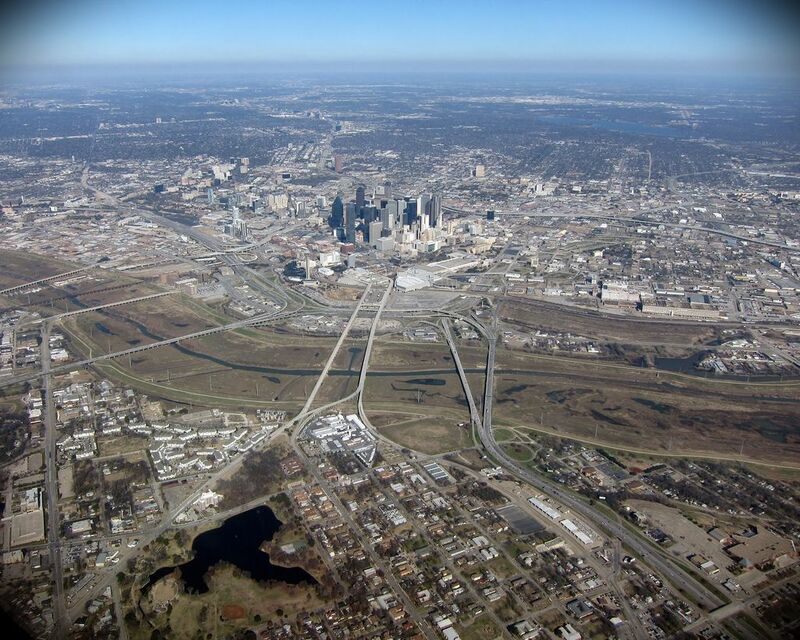 Outside the downtown core, Dallas possesses inconsistent urban density as it sprawls outward. America’s ninth-largest city, Dallas has a population density of around 3,500 people per square mile, slightly lagging behind Houston and Atlanta. Throughout the city, new developments plagued by parking minimums have made residential infill projects in neighborhoods like East Dallas as marked by their lots and garages as by their new architecture. Despite low densities across the city, Dallas has an 85-mile, four-line light rail system whose first sections — 20 miles in all — opened in 1996. Ridership has been strong, and in 2006 Dallas Area Rapid Transit (DART) announced its “2030” plan for major extensions. In its original agreement with the city, DART agreed to open a second downtown alignment once it achieved ridership goals. After meeting goals and studying alignment costs, DART concluded that a new alignment would cost between $500 million and $1 billion. Work is not likely to commence before 2025. New streetcars won’t be the only ones, however, because Dallas already has a line in service. Although the historic system closed in the 1930s, residents of the Uptown neighborhood pushed to reopen the McKinney Avenue streetcar after a street crew found tracks under the pavement. In 1989, the streetcar resumed operation with historic stock cars under a separate transit authority. Today, the McKinney Avenue Streetcar Line is poised for a second expansion that would join Upton to Klyde Warren Park. And Dallas has experienced other preservation successes in recent years. The city has designated 21 local historic districts since 1973, and in 2010 Preservation Dallas negotiated an amendment that retained the Landmarks Commission’s right to review demolition orders for officially designated historic buildings deemed “nuisances.” That victory, however, is no silver bullet in the battle to preserve valuable historic structures. In 2012, Dallas residents watched aghast as a dynamite blast felled a beloved cotton warehouse built during the city’s early-20th-century cotton boom. The historic eight-story Thomas Building lacked the landmark status needed to protect itself from hasty demolition. Dallas remains a city struggling to reconcile its past with its present and future. In that way, it today shares much in common with legacy cities across the country. But for those cities, it can also offer some strong examples of what is possible when civic leadership champions good urban design. If Dallas can remove a downtown freeway next, it could lead the 21st-century legacy city narrative of undoing problematic 20th-century infrastructure. The 2010 Census recorded the slowest growth rate ever for Dallas, yet the city continues to evolve. It’s reasonable to hope that Dallas’ future may bring more of the visionary urban design championed by groups like A New Dallas. Their vision is one that, on the 50th anniversary of Kennedy’s assassination, feels right. It picks up the post-Kennedy-era civic idealism well but, like the idealism of that time, is very much steeped in the struggles of today.